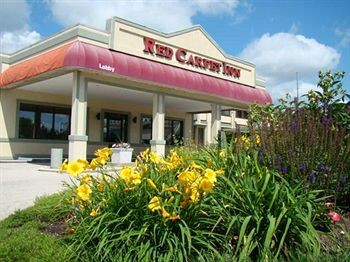 Property Location Located in North Chicago (Waukegan - Gurnee), Red Carpet Inn Great Lakes is convenient to James Lovell Federal Health Care Center and Rosalind Franklin University of Medicine and Science. This hotel is within close proximity of Naval Base Great Lakes and Lambs Farm.Rooms Make yourself at home in one of the 94 air-conditioned rooms featuring refrigerators. Complimentary wireless Internet access keeps you connected, and cable programming is available for your entertainment. Bathrooms have shower/tub combinations and hair dryers. Conveniences include irons/ironing boards, and both cribs/infant beds (complimentary) and rollaway/extra beds are available on request.Rec, Spa, Premium Amenities Take advantage of recreation opportunities such as an outdoor pool, or other amenities including complimentary wireless Internet access and tour/ticket assistance.Dining A complimentary continental breakfast is included.Business, Other Amenities Featured amenities include a business center, a 24-hour front desk, and laundry facilities. Free self parking is available onsite.